Earlier this year, Microsoft introduced its ‘How Old’ facial recognition tool which managed to both amuse and outrage in equal measure. Now, the company has revealed a similar piece of software that tries to work out what emotions a person is displaying in a photo, rather than their age. 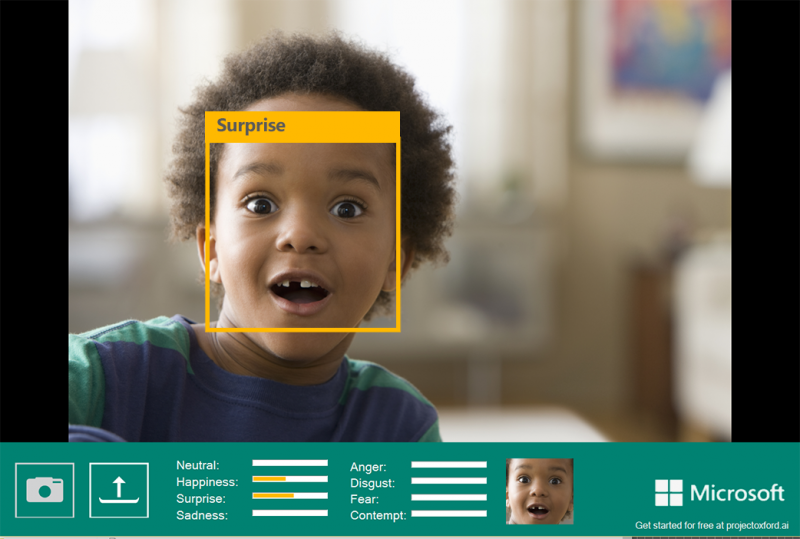 The team behind Microsoft’s Project Oxford, a set of developer tools based on machine learning and Artificial Intelligence, announced the public beta release of the emotion detection technology at the company’s Future Decoded event in London. 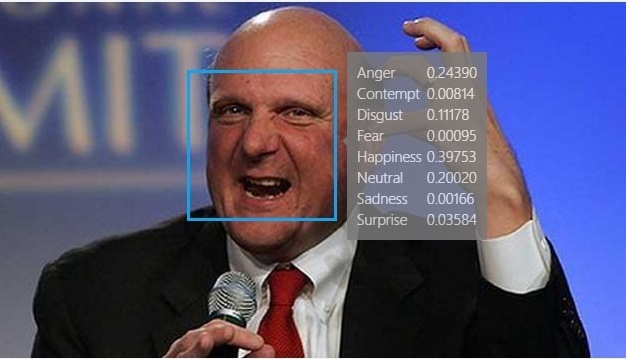 The tool trains computers to recognize eight core emotions: anger, contempt, fear, disgust, happiness, neutral, sadness and surprise. You can try it out by uploading a JPEG, GIF, PNG, or BMP under 4MB in size at this site. Microsoft says using near-frontal or full-frontal facial picture will give the most accurate results, and that the system is able to recognize up to 64 different faces. "Humans have traditionally been very good at recognizing emotions on people's faces, but computers? Not so much. That is, until now,” Microsoft said in a blog post. Ryan Galgon, a senior program manager within Microsoft’s Technology and Research group, suggested that developers could use the emotion tool to create systems for marketers to gauge people’s reactions to a store display, movie or food. It could also be used in consumer products, such as messaging apps, in order to offer up different options based on what emotions are recognized in a photo. Much like Microsoft’s ‘guess your age’ tool, the emotion recognition technology isn’t always totally accurate. Registering each emotion on a scale of zero to one, it works best with obvious facial expressions, such as a huge grin, rather than more subtle or mixed ones. It is worth pointing out, however, that the Emotion API is designed to become smarter as it receives more data. In addition to the emotion recognition technology, Microsoft is releasing public beta versions of several other Project Oxford developer tools by the end of the year. This includes a spell checker that can recognize slang words, video analyzing software that can track faces, improved speech recognition tools, and updates to existing facial recognition programs (including the age estimator) so they can better identify elements such as facial hair. If it's as flattering as the "How Old' tool was to me, it estimated I was 15 years younger than I really was, I think I'm gonna like this one as well. I won't try the 'How Old' tool again, MS may have have improved it or in my case, made it worse. I'd sit pat with a result like that. A second estimate that gives you a lower figure will just introduce the nagging feeling that the software is bugged, and you aren't in fact looking young for your age. A higher figure is an instant buzzkill. ikesmasher and Skidmarksdeluxe like this. The results aren't meant to be taken seriously, just with a ladle of salt. It's more of an entertainment tool for us than anything else but for MS it's a serious business. I wouldn't be at all surprised if it's been incorporated into Win 10 in some way to take advantage of the devices camera. I'm fairly convinced now that MS is pushing out Win 10 for free because of its ability to datamine huge volumes of data. For the express purpose of feeding that data into their AI development program. Projects like the one in this article encourage users to try them out, feeding even more data to MS. I'm not saying this as a Doomsday - Skynet - OMG AI thing. Any AI program needs massive amounts of data to start producing accurate results and where are you going to get it from? I'm sure Cortana is helping too in the same way that Apple stores every query made on Siri and Google probably does on Android devices. Data is being hoovered up on a vast scale by all the major tech players and the only profitable use for that much data involves an AI. Most of the big money will come from the same place it always has - advertising. Its doubtful that anyone makes money from simply returning results on searches, esp. with the expense of all that server infrastructure. Its the pay-for-placement and shared click-through revenue that's turned all of us into the product. Humans already have an effective tool for interpreting and empathizing with their emotions. It's called, "a dog". Hey look, you don't get "God" if you spell "Gates" or Jobs" backwards, now do you? No, but if you combine Gates and Jobs you get "OS jest gab"
I would have thought "Bill Gates Microsoft Steven Jobs Apple Corporation" would anagram out to, "for Christ's sake leave some money for the rest of us"